From time-to-time, ARMN will post profiles of its members including how they came to be master naturalists, which parts of nature they most enjoy, and how they work to impact the environment around them. Here is the latest interview with ARMN volunteer, Toni Genberg, who graduated in the Spring 2014 ARMN training class. Tell us about the naturalist projects on which you spend the most time. An enjoyable short-term project I volunteered for was the Smithsonian’s eMammal survey. I would deploy a wildlife “trap” camera for a month at a time at three pre-assigned parks and in three backyards of my choosing. I would then retrieve the camera, download the data, and count and log the critters that were photographed. There were lots of deer, of course! But once I also “captured” a coyote in Holmes Run Stream Valley Park, which was exciting. An eMammal photo with deer and fox in Marie Butler Leven Preserve in McLean, November 2014. An on-going project I’ve been a part of since before I became an ARMN member is outreach at the Falls Church Farmers’ Market. The “Enviro-Booth,” as it’s nicknamed, is set up on Saturdays from October through April as long as the weather is amenable. ARMN member Kent Taylor, the booth’s founder and I, along with other master naturalists, a master gardener, and a tree steward set up a display board, put out lots of informative handouts, and interact with many inquisitive market goers. We’ve had some good conversations with the public about ARMN’s English ivy “Choking Hazard” promotion, Audubon at Home’s Backyard Habitat program, and the Plant NoVA Natives Campaign, among other environmental topics such as tree care, solar power, storm water management, composting, and more recently, the problems associated with rodenticides. The organization I share most of my time with and thoroughly enjoy volunteering for is Earth Sangha. At first it was because I was interested in native plants and the fact that much of life depends on them (I think all of it?) but now I’m fully vested in this non-profit because of the blood, sweat, and tears that founder, Lisa Bright, and the rest of the Earth Sangha family sheds in their mission to restore our natural areas. I’m one of currently four Nursery Volunteer Supervisors. This means I help wrangle volunteers of all ages at Earth Sangha’s Wild Plant Nursery but mostly I do what all the other invaluable volunteers do: weed, water, repot, collect and clean seed, remove invasive plants, and plant wild areas with Earth Sangha’s lovingly raised native species. A long-time proponent of critters, I wanted to do the right thing on my own property when it came to gardening. So when a master gardener neighbor invited me to a lecture by entomologist Dr. Doug Tallamy, I naturally went. 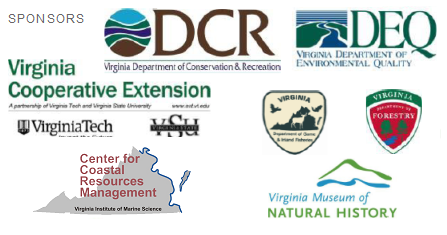 There were not only master gardeners in attendance but also people with the intriguing title of Virginia Master Naturalist. Master Naturalist? What’s that? It certainly sounded like something I wanted to be a part of. I chatted that evening with some very like-minded people who were earthy and kind and my mind was made up. I knew I wanted to pursue my master naturalist certification. I later met an ARMN member who confidently stated that Arlington was the best chapter to enroll in. Earth Sangha’s close relationship with ARMN sealed my fate. I graduated with the fabulous Class of Spring 2014. Oh, about the Doug Tallamy talk: his argument for native plants was undeniably life-changing. No doubt ARMN is an amazing organization because of the people. There are all these members with the common goal of helping Mother Earth by generously donating their free time—what better group of people to associate with? The naturalists I’ve met also have an incredible amount of knowledge and enthusiastically want to share it all. When I think about ARMN and the friendships I’ve made, it’s clear that I’ve found my environmental family. What would others find interesting about the non-ARMN parts of your life? For about four years I was one of the video editors of the environmental news magazine, “Earth Focus.” It was my first headlong plunge into the issues facing the planet. Some of the topics covered were fracking, nuclear power, neonicotinoids, the changing climate, everyday chemicals, trash, wolves, elephants . . . you name it; if it was hurting people or the environment, we had a story for it. Although most of what we covered was quite depressing, it ultimately opened my eyes and helped shape me into a better steward of the earth. I was born and raised in Hawaii where the balmy outdoors was always beckoning. And like most of the other local country kids, I spent a good portion of my free time outside—playing in the ocean, investigating tide pools, climbing trees, riding my bike, or exploring some wild area. Hawaii has an inordinate number of crawly things so these creatures were also a part of my everyday life. I liked to play with spiders and salamanders and was always eager to find a rock to overturn. With no regrets I regularly chased my dismayed sister with large garden spiders—always returning the arachnids unharmed, of course. My mother has always cared deeply for all animals and I definitely inherited that love from her. Toni as a young child with dove in Hawaii. Leaving as small a footprint as possible is a way of life for my husband, Marc, and me. Granted, we’re far from perfect but we’re always looking to do more for the health of the environment. Refusing plastic, for instance, instead of taking it and thinking it’ll be recycled, because odds are it won’t, is a perfect example. It’s easy enough to carry reusable items like a water bottle, utensils, bags, and the like. I also believe in making sound purchases while striving to be even less of a consumer. Zero Waste Home by Bea Johnson is a wonderful book with many green philosophies. Not wasting tangible things is the main focus but it’s also about saving time and living simply. Are Marc and I ready to live in a thatched lean-to with zero electricity? That would be a “heck no.” But we definitely can strive for a less impactful lifestyle. What a neat profile of Toni. I was bicycling through Holmes Run ( to Inova Fairfax to visit an ill ARMN friend) in late summer of 2015 and I came upon what I think might have been a coyote. Still not sure, but it has been fun to speculate.